When I opened my front door to let my dogs out this morning, I saw another person running. It’s snowing (March 1st is tomorrow…Minnesota…) and the sidewalks are icy. I don’t like to walk, let alone run, when I see ice. Even if it’s not directly underneath me. I see ice a distance away and anticipate my fall. I have trouble enough walking without tripping over myself. I’m just not a runner. I’m not built to be one. Not a long distance one at least. My point is this-there isn’t one. Maybe a little of why do very thin people keep running when it’s frigid and nasty out? Why do I gain weight when I run 3 miles 4 times a week while watching what I put in my body? How many accidents involve someone in the street who refuses to move even slightly? Why do guys wear teeny shorts to run? What’s with the bright shoes? Once I saw a group of female runners (because they do so in a herd often) in town who stopped at the light then I saw a female running who was obviously with the group but in shape much like me and I couldn’t help thinking hell yeah, girl. When she got to the light not a one of those girls acknowledged her and I thought to myself I wish the light would’ve changed as she approached so she could run past them before their shuffling feet moved forward and high five herself in her head, leaving her wondering if anyone else saw. Don’t worry, I saw and shared in it. But it didn’t really happen. But moreso no point. Unless…ice…fish…salmon…and wham, dinner. Or runners eat and if they are mostly thin and in shape they probably eat lean fish like the salmon below and/or lots of vegetables. Or the runners here wear shoes and shoes used to be made of fish scales and probably still are. Greg’s great grandpa used to make shoes made of scales when he arrived from Ireland so said his grandma. I have arrived. I thought this simple dish didn’t side on sucktastic. Far from it. Even though I inhaled the wasabi powder when I opened the container (because water has to be added to make a paste of course) or when I grated my finger with the ginger. If I were you, assuming you like a bit of kick, I’d add more wasabi paste to the mayo and double the amount of garlic and ginger. You end up putting half in the dip and the other mixed with the oil and veg. I did so from instinct. You know, the one where you neglect any directions or advice from anyone pretty much all the time. I do that. It was based on experience in the kitchen too. Oh, and I wouldn’t roast this at 450 like it said. I’d do more around 425 and just keep an eye on it since the time will vary. 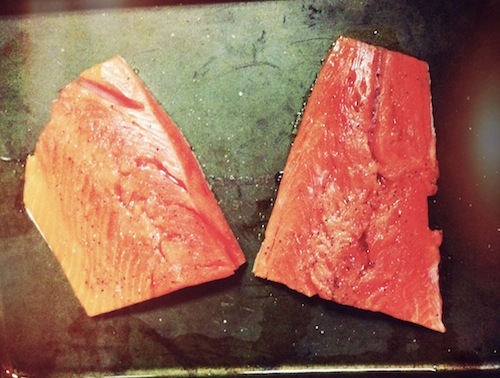 The salmon was done first which is why I was glad that instinct kicked in and said use 2 baking sheets instead. Even though it was a recipe under the category of “one pan meals” from Bon Appetit. Don’t forget to stir the veg at least once. My baby bok choy were big babies so I quartered these instead of halving then decided they are easier to eat in individual leaves and took them apart. I think that about does it. 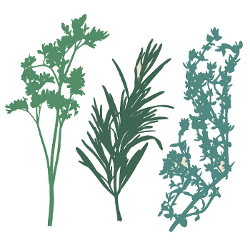 Because I like playing with my food, here’s an “artistic” rendition of the meal. It wasn’t a terribly visually appealing dish and I’m still playing with the Camera+ app. Your eyes will suffer. Sorry. Preheat the oven to 425F. Meanwhile, mix mayonnaise and wasabi in a small bowl. Stir in half of the ginger and half of the garlic; set aside in the refrigerator. Season fish all over with salt and pepper. 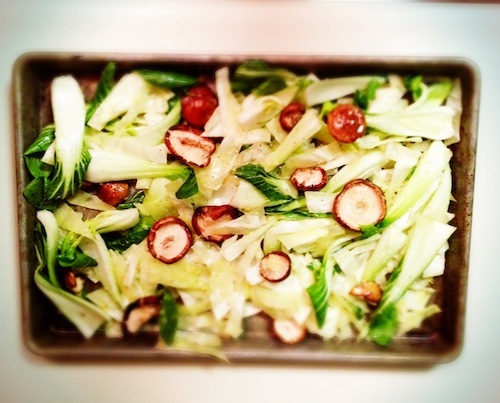 Place bok choy, cabbage, and mushrooms in a large bowl. Drizzle with oil and add remaining ginger and garlic. Toss to coat; season with salt and pepper. Scatter the vegetables across one rimmed baking sheet and arrange salmon on another rimmed baking sheet. Roast, stirring vegetables occasionally, until salmon is cooked through, 15–20 minutes (will probably have to remove one before the other hence 2 sheets) then remove both from the oven. 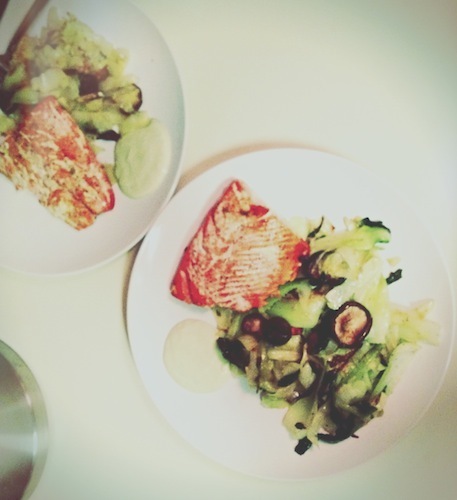 Divide vegetables among plates; top with salmon. Serve wasabi mayonnaise alongside. Beautiful and healthy dish. I have the worst luck with salmon so I need to give your recipe a try. As for running? I can’t do it. I walk and walk and walk, but running just doesn’t agree with me. I wish it did! Maybe after baby I’ll get into a routine, as for now, it’s me and Margot on our morning 2-mile “hike”. I’ve been thinking of you and your move this week. Hope all the prep is going well. Hugs!